The Raspberry Pi makes a good remote desktop client. I use them to remote to Windows terminal servers. I Velcro the Pi to the back of a 1920x1080 monitor. 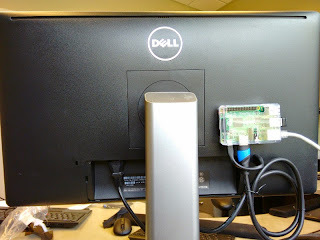 The Pi is powered by the monitor's USB port. To boot right in to a remote desktop session, create a Bash script /home/pi/remoteDesktop.sh. The Pi will boot up in to the remote desktop session of your WinPC. If the user logs out of Windows or tries to escape, the script will run the rdesktop command again. This is not hacker proof or anything like that. The user can hit Ctrl-Alt-Enter to exit out of full-screen and kill the Bash script.